Text by Julie Weisenhorn, Extension Educator. Photos by Esther Jordan, Communications Specialist. 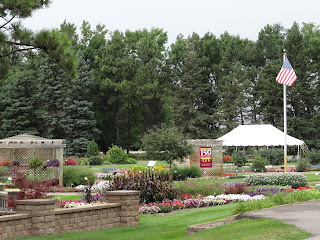 Y&G: What kind of soil and watering system do you have at the Horticulture Display Garden? Poppe: We are blessed with well-drained, silty loam prairie soil with a pH of 7.2. Every three years, we add composted animal manure from WCROC. The Garden has a full irrigation system and is equipped with in-ground water tensiometers (moisture sensors) installed 2-3” below the soil surface (in the root zone). We water every plant by hand immediately after planting so we can be certain the transplants are well-watered and any transplant stress minimized. Hand-watering also avoids wetting the soil of nearby beds before they are planted. Y&G: How do the moisture sensors work? Poppe: In general terms, the in-ground moisture sensors or tensiometers measure soil water tension. A lower number means the plant root area is fully saturated. Our threshold for watering is around 30 centibars. However, because soil can vary between planted areas within an irrigation zone, we don’t water based only on the moisture sensors. We also take in consideration the plant types, wind, air temperatures, humidity, etc. and try come to a compromise that will provide enough water, but not too much. Y&G: What are some problems you’ve seen from too much water, not enough water? Poppe: It’s important to be familiar with each plant’s water needs. For example, if you have annuals that don’t require much water like vinca or geranium, and you are using an automated irrigation system, locate these plants in a drier site. If they get too wet, they will likely contract root rot. Likewise, a plant that isn’t getting enough water will suffer drought stress. For our perennial trials, we use drip tube irrigation instead of overhead sprinklers and monitor irrigation needs with water sensors. Drip tube irrigation reduces disease issues from splashing water. 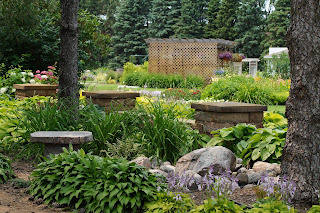 We have to be careful not to overwater perennials that are mulched and planted in the Display Garden. We are also always worried about frost and thus may wet down plants with water if frost is predicted. Y&G: To mulch or not to mulch …? Mulch in general is a great asset to garden beds to retain moisture and keep weeds under control. We do mulch some of the perennial beds in the Display Garden. However, gardeners may want to consider waiting until the soil warms up before applying mulch. In the spring, exposed black garden soil will retain heat, warming the soil and the plant roots. Mulch can also be overwhelming for delicate new transplants, so I recommend leaving the beds exposed until the plants are about 6” tall, then apply 3” of mulch to control weeds, retain soil moisture and provide a nice finished look to the garden. Warm season vegetables like tomatoes and peppers will also benefit from not applying mulch too early. Y&G: Would you recommend home gardeners put down a slow-release nitrogen fertilizer before applying mulch? What about before and after planting? Poppe: Yes. As wood mulch breaks down, it will use nitrogen in the soil, so it’s a good idea to add some supplemental nitrogen fertilizer before applying wood mulch. Prior to planting our annual flower trial, we apply a 20-20-20 granular fertilizer, and, after annuals are transplanted in the garden, we fertilize with ammonium sulfate (21% nitrogen and 24% sulfur). We apply this in mid-July to give plants a boost prior to our annual Horticulture Night, and toward the end of the season when they are looking a little tired. Y&G: Do you ever have issues with deer? deer enclosure because we can’t tolerate any animal browsing on these plants. At the Horticulture Display Garden, we put down deer repellent right after planting to protect the annual flowers. We rotate repellents because deer will become accustomed to a product. Spray repellents are washed off by irrigation and rain and must be reapplied, so we most often apply a granular product called Deer Scram around the outer perimeter of the garden beds. The deer don’t like the smell and it lasts about 30 days. If they start to browse on some plants, we’ll treat with a systemic repellent. A systemic is applied to the plant foliage and taken up by the plants, so it isn’t washed off by irrigation or rain. Y&G: Are there any insects or diseases that you regularly encounter? Do you have Japanese beetles? Downy mildew? Soil-borne problems? 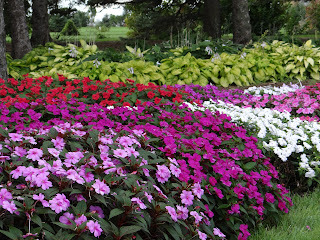 Poppe: No, fortunately we don’t have Japanese beetles, and the downy mildew on impatiens hasn’t been a problem. Most of our insect pest issues occur in the greenhouse – fungus gnats, spider mites, aphids, etc. Being on the prairie, it tends to be windy, so the plants have good air circulation which helps dry off leaves and reduce foliar diseases. Gardeners should remember it’s an important cultural practice to space plants based on their mature size and plant in an area that has good air circulation to encourage the plants to dry off. Y&G: What are your top 3 best practices for watering annuals and perennials? Poppe: Watch the moisture needs of newly planted transplants. Hand-water plants at the roots immediately after planting. This reduces transplant stress while it is getting established and building its root system. I recommend hand watering for home gardeners so you know for certain the water is getting right to the roots. Look at the plant. When you’re selecting plants for purchase from a greenhouse, avoid choosing plants that are too tall or spindly. Pass over the plants that show signs of too little water (wilting, tipping over) or too much water (yellow leaves, leaf drop, saturated soil). Choose healthy, compact plants with good root structure. Once transplanted, these plants will be able to easily take up water and nutrients from the soil. To check the root structure, gently remove a plant from the container and look at the root mass. The roots should be bright white, firm and plentiful. If the roots are brown and mushy, don’t buy that plant. Feel the soil. Water sensors are great tools, but we still feel the soil with our hands to see if it’s too dry, or too wet. Just grab a handful down about 3”. Is it wet? Dry? Moist? Feeling soil is the best gauge! PS which systemic deer repellent do u suggest?